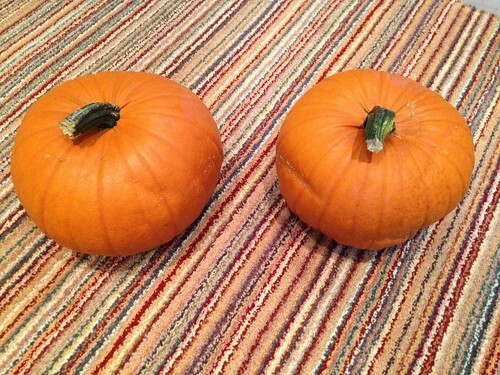 It started with a pair of pumpkins. 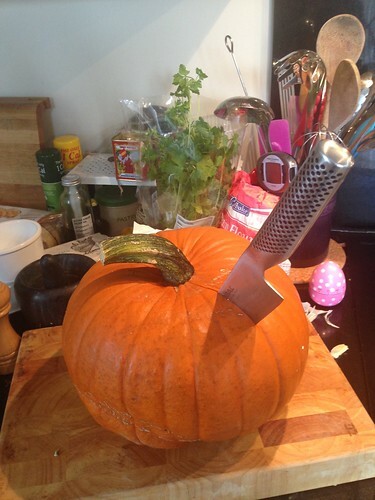 My boyfriend arrived home with the suggestion of a carving challenge, but I fancied a cooking challenge! If you think about it, there aren’t many obvious things to make with a pumpkin, other than soup or pumpkin pie. 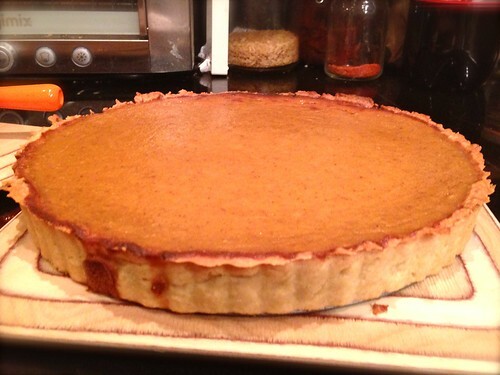 I searched online and through cook books for inspiration but decided since I hadn’t ever made pumpkin pie that I’d give it a go. 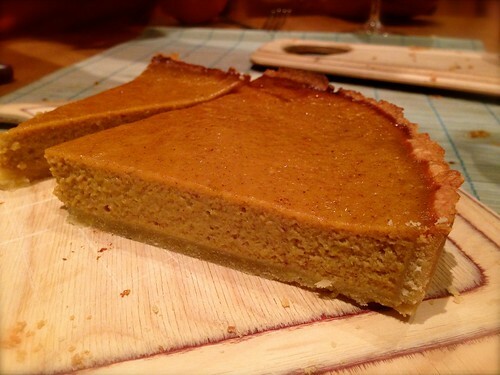 I searched through various pumpkin pie recipes and loosely based it on Felicity Cloake’s Pumpkin Pie Recipe. I added bourbon instead of rum, allspice instead of ground cloves (I couldn’t be bothered to grind up my whole cloves!) and also made my pastry really easily in my Magimix. 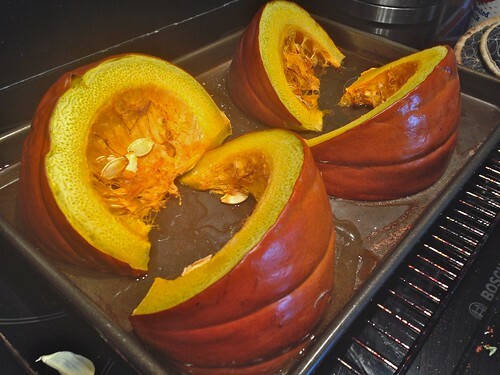 I started by roasting the pumpkin, which was different to the BBC Good Food Pumpkin Pie Recipe which calls for boiling. After roasting, the pumpkin is peeled, whizzed up to a puree then strained over a sieve to remove the liquid (there was loads!). I hadn’t made pastry myself for years so thought it would be nice to give it a go. 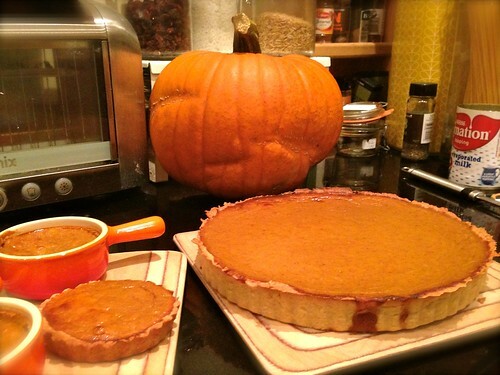 I overfilled the pastry a little and had excess too, so filled my little pumpkin coloured Le Crueset pots and made a couple of baby pies too. Sadly, I didn’t quite cook the pastry enough on the blind bake, so created myself a bit of a soggy bottom! The pie was delicious though, and was the perfect end to a delicious American Feast! It wasn’t too sweet, had a lovely autumnal feel to it and a perfect amount of spice. Despite the soggy bottom, the pastry was deliciously crisp round the edges. Look out for my next post which will include Tom Kerridge’s amazing fried chicken, the star of the feast! What will you be making with pumpkin this Autumn? Let me know if you have any recipe ideas! I’ve started blogging at www.fabulousfoodfinds.co.uk so if you want the most up to date posts and news, please sign up to posts by email, or follow there. Thanks!